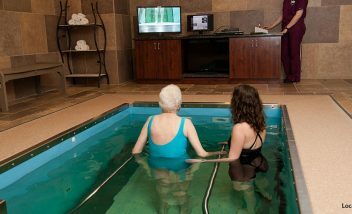 HydroWorx 1200 Series resistance pool technology is a quantum leap forward in aquatic therapy equipment. Its high-tech design allows clinicians with limited space to enjoy the same benefits of our 2000 Series physical therapy pools, in a more compact package. The HydroWorx 1200 Series contains the same moveable floor and underwater treadmill technology that the HydroWorx 2000 made famous, but its dimensions are condensed into a 6′ wide by 9’6″ long footprint. Moveable floor technology eliminates any accessibility limitations. The recommended minimum poolroom dimensions are 15’ wide by 25’ long. This 6’ wide x 9’6” long pool is designed to accommodate from 1 to 2 people at once. 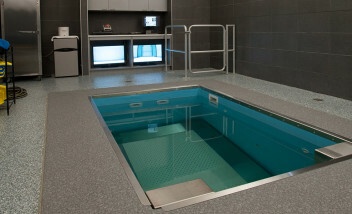 The entire pool floor is fully adjustable in height up to six feet allowing patients or athletes to safely enter the water with no ladders or steps to worry about. The entire entry and lowering process takes only 30 seconds. The variable speed treadmill, which smoothly increases from 0 to 8.5 mph in safe .2 mph increments, has a cushioned low-impact design with excellent traction. Customize the 1200 Series to include two underwater cameras and a flat screen viewing monitor to greatly enhance a clinician’s diagnostic capabilities when evaluating a subject’s underwater gait pattern. All functions of the HydroWorx 1200 are controlled via a water resistant remote control unit. The jet has nearly 200 different water speeds to choose from for variable water massage therapy. Nine massage jets are available in a trigger point pattern for a soothing underwater massage. The automatic water leveling system detects the decreasing water level as a result of evaporation or splashing and automatically maintains the water level. 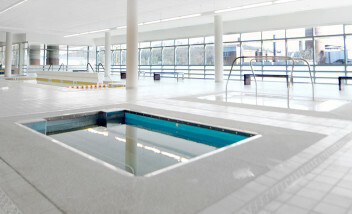 Why are the 1200 Series pools the most advanced therapy and fitness pool in the world? The adjustable pool floor allows the users to walk or be assisted onto the pool floor at deck level and lowered to any water depth up to six feet. 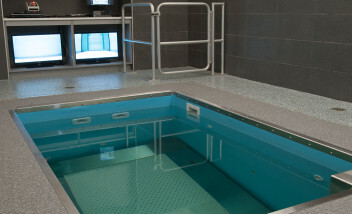 As a result, aquatic therapy can be initiated earlier in rehabilitation for patients with a wide range of injuries. The completely integrated underwater treadmill allows patients and athletes to correctly simulate land-based biomechanics. Sports specific exercises are especially effective when performed on a large underwater treadmill that allows room for full hip rotation and bounding movements. The large surface area of the treadmill allows for therapy sessions designed to closely simulate the patient or athlete’s particular sport and position. The video system allows athletic trainers and physical therapists to diagnose gait patterns, record treatment sessions and document their patient or athlete’s progress. The individual being treated benefits from being able to see himself or herself on the flat screen monitor and execute the desired protocol faster, thus speeding up the healing process. The water-resistant hand-held remote controls all functions of the 1200 Series pools. This gives the athletic trainer or physical therapist complete freedom of movement while administering treatment or conditioning sessions. Computer documentation: HydroWorx owns the proprietary rights to the software that was written exclusively for the HydroWorx Series pools. The software monitors the pool functions, treadmill speed, and jet power then uses this information to display current session information, and stores the information in a patient database for future reference and progress reports. Who are a few of your 1200 Series customers? What is an example of how the college & pro sports teams utilize the HydroWorx 1200 Series pools? What is the difference between the HydroWorx 2000 & 1200 Series pools? The features and structure of the 2000 Series and 1200 Series are the same. The only difference between the two therapy pools are the size. The 2000 Series is 8′ wide x 12′ long and can accommodate up to six patients or athletes at one time. The 1200 Series is 6′ wide x 9’6″ long and can accommodate up to two patients at one time. The advanced features of the HydroWorx 1200 series resistance pool make it ideal for a number of diverse applications. Patients with mobility, balance or fitness issues will benefit from the moveable floor that allows for safe access without ladders or steps. Elite athletes have used 1200 Series pools for resistance training and conditioning; the included video monitoring system makes it easy for athletic trainers to track their clinical progress and ensure proper technique. HydroWorx offers full follow-up support to purchasers of our 1200 Series resistance pools.